Traditional pasta is a big no-no when it comes to being fit and toned, so many fitness enthusiasts turn to vegetables for their noodle fix. This is a wonderful recipe to make a big batch of and to use throughout the week for meal prep by adding chopped, grilled chicken breast for protein. There’s tons of flavour and fibre to keep you fuelled and happy. 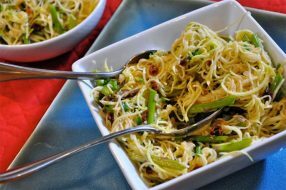 You’ll need a spiraliser for this recipe, in order to create long, noodle strands out of Courgette​. If you don’t already have a spiraliser, it’s a great tool that makes low-carb noodles quickly and easily. The addition of roasted asparagus to this pasta is simply delicious. Enjoy! 3. Trim the ends from the Courgette​ and use a veggie peeler to remove the green skin. Cut the Courgette​ in half, width-wise, then run through a spiral slicer to create long, angel hair noodles. Place the noodles in a large bowl. Add the sun dried tomatoes and roasted asparagus.